Following typical New Zealand railway practice I have constructed and installed cattle stops to either side of a level crossing on the H&MGR. The wood has been ripped down from Kwila hardwood decking on a full size bench saw. Rather a lot of off cuts are generated to ensure safe use of the saw. I.e. do not try and save timber, else you fingers will get way to close to the saw blade! The timber I used was 19mm thick so that set the depth of the main beams, and as such is not critical, but has turned out to look about right once installed. Scale wise I work to approximately 1:24 so you may need to beef up the width and length for large scales. Not the 3mm width of the stop bars matches the width of my saw blade, the reason why will hopefully become apparent as I detail the construction. Joints are notched glued and pinned, or in the case of the side fenced mortised and glued. We start with cutting slots for stop bars and notches for rail beams in a full piece of decking timber, preferably some 400-450mm long. 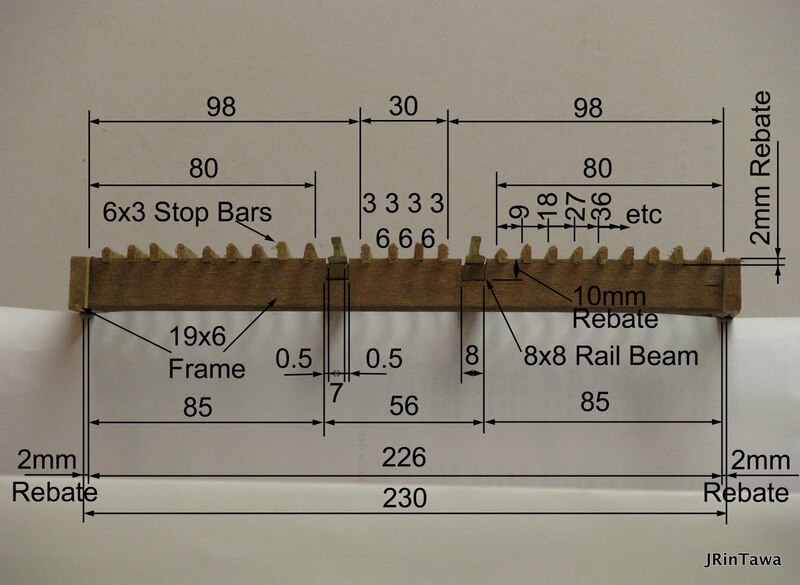 The rip the decking timber to 6mm strips and cut the 230mm long traverse beams. 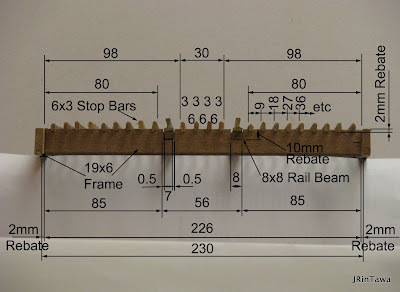 From the off cuts the required 2mm deep 6mm wide notches are cut and cut to 120mm long for the side beams. The basic frame is now dry fitted, 8x8x8mm long rail beams are also dry fitted having been ripped down from more decking timber. The main frames are now glued and clamped up in the trusty Black & Decker Workmate. Check for square with a builder's square and check measure the diagonals. Once the glue is dry I pin the joints (predrilling undersized holes and gluing pins). 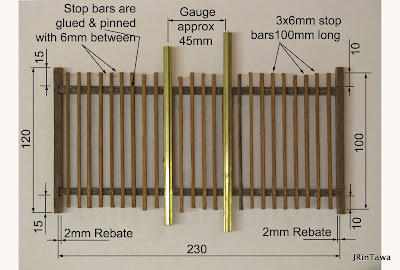 The main frame and rail beam pinned with panel pins (small nails). Another pre-asembly phase is to cut, sand and assemble the fences that go on the end of each cattle stop. Fence posts are 8x8x150mm long, they are long to be sunk into the ground as you see later. The assembled fences, which will be given a deliberately rough coat of white paint before final installation in the garden. First dig out a trench larger than the final pit so you can comfortably cut away 3 sleepers and clean the underside of the rail. Next slide the cattle stop into place, run a bead of builder’s outdoor adhesive on top of both rail beams and clamp into position to dry. And as the say "to the left is one I prepared earlier"! Installing the end fences is next and is tricky. I used piece of timber some 10x10mm to punch postholes deep into basecourse and clay subgrade under the railway into which the fence posts are installed. It takes a couple of goes to get the postholes in quite the right place so the end fences go in nice and plumb, and in some waysis a bit easier if the posthole are a bit big, you can tamp soils back around the installed posts to tighten up. Different ground may require different techniques but with good deep fence posts will help strengthen the final cattle stop assembly. Once happy with the fence posts, and while the clamps are still in place on the cattle stop I pin the fence posts to the end beam of the cattle stop with a couple of panel pins (nails). I probably glued the joint to! And so you now have a set of cattle stops - as easy as that! Over the Christmas / New Year break I added a long planned second level crossing to lead the road under the second span of the truss bridge where the railway crosses over itself. It was a much tighter space to install the cattle stops, but with patience the same method was used with the exception of the fences which were assembled in place rather than installing as complete units. Day One, cattle stop frames assembled in the workshop. Day Two, trenches dug and cattle stops installed. Fences constructed and balance of stop bars installed. Fences painted, level crossing timbers added (dimples to represent bolt holes where timbers would be coach screwed to sleeps still to be done). Day Four and a few sundry afternoons after that! Roadway tidied up, a rock added into the garden to tidy up the bank and some extra ground covers added onto bank and we'll call it job done. So there we are, a new photo spot, and I hope the two level crossings with the roadside rail iron and wire rope fence running alongside the road between has created the feeling of a quite country lane. And maybe just and occasional Bush Jigger to disturb the tranquility!